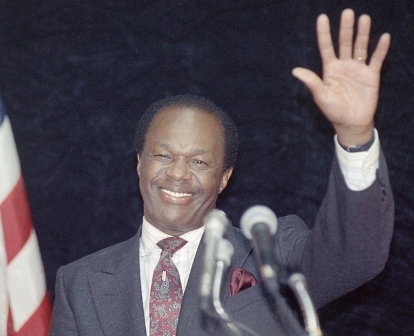 For many Americans, Marion Barry was something of a punchline. The late Washington mayor was largely known around the country for having been caught on video smoking crack cocaine in a 1990 FBI sting. But inside the District of Columbia, Barry’s legacy is far more complicated and emotional. The man who dominated a generation of Washington politics is adored by many as a champion of civil rights and advocate for the city's downtrodden. These complexities will be on display this weekend when a bronze statue of Barry, who died in 2014, will be unveiled outside the Washington City Council building. The 8-foot statue by sculptor Steven Weitzman will loom over Pennsylvania Avenue just blocks from the White House. The move to honor Barry in such a way may seem mystifying to non-Washingtonians. But among Barry’s supporters, the statue is an appropriate tribute to a legitimate DC icon — a man so popular and influential that he walked out of federal prison and immediately began winning elections again with one of the most improbable comebacks in American political history. Regardless of the personal opinions on him, there’s no denying that Barry had a massive influence on the capital city. With modern Washington undergoing widespread gentrification and large numbers of poorer black residents being priced out and leaving, Barry evokes an earlier time when the District truly was “Chocolate City” — one of the power centers of black America. Despite his widely acknowledged personal failings, he is regarded as having enriched and elevated other black residents, and partially credited with helping create the robust black middle class that populates both Washington and neighboring Prince George’s County in Maryland. A local columnist in the 1990s coined the title “mayor for life” — a term which evokes something closer to a third world demagogue than a modern democratic official. But Barry’s supporters embrace that nickname as a badge of pride, a symbol of Barry’s lifelong connection to the city and its residents. A generation of black Washingtonians got their first paying jobs through one of Barry’s summer youth employment programs. Barry brought a legitimate and undeniable pre-politics resume as a pioneering civil rights activist. A Memphis native, Barry became heavily involved in the nascent civil rights movement as a university student in the late 50s and 60s, serving as the first chairman of the seminal Student Nonviolent Coordinating Committee. He moved to Washington in 1965 to run the SNCC office there. Barry quickly became deeply involved in Washington’s Black community, founding a program to provide job training to unemployed black men and getting elected first to the school board, then to city council. In 1978, he became Washington's second elected mayor. He served three terms, which were marked by increasingly erratic behavior, corruption allegations and widespread suspicions of drug and alcohol abuse. The 1990 sting and subsequent trial caused him not to seek a fourth term. He was sentenced to six months in prison for cocaine possession, although a deadlocked jury couldn’t convict him on some of the more serious charges. After his 1992 release, Barry immediately ran for and won a seat on the city council, then successfully ran for mayor again in 1994 and served one term. Barry left politics for few years, then ran for city council again and won in 2005, serving until his death in 2014.